Here at HipDial, we know that when you schedule a phone meeting, you expect it to go off without a hitch. That’s why we are taking today’s outage very seriously. This afternoon, a small portion of our phone calls did not go through when Amazon Web Services went down. HipDial was impacted, along with Instagram, Pinterest, Netflix, and other popular internet services. First, we are now hosting our phone service redundantly. We’ve added Rackspace as a secondary failsafe host so that even in the very rare event that Amazon Web Services (which has a 99.95% uptime guarantee) fails, your calls will still connect. Second, we are launching a page that shows HipDial's status and uptime over time. We hope this page will be useful for diagnosing call issues. If there is anything more we could do for you or if you have any questions, please let us know by reaching out directly at founders@hipdial.com. Each conference line has a list of host numbers. Whenever somebody calls the line from one of those numbers, they are considered the host and the call will start if people are waiting in line. If you frequently call in from a different phone (e.g. your office phone or a a phone in a conference room) or if you want to share your line with someone, you can add that phone number to the list. 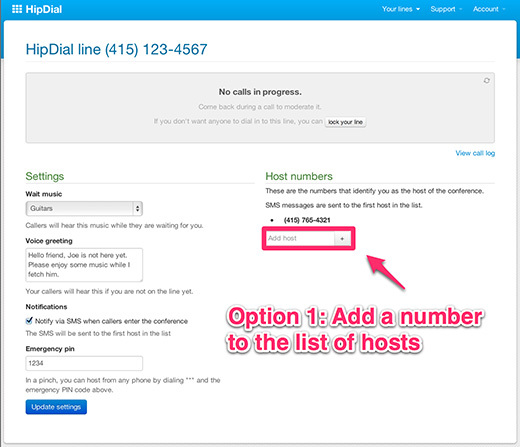 If you have a corporate account, you can set up a global list of hosts that will work for all your lines. If you're calling in from a phone without caller ID (e.g. from Skype or some VOIP phones), you can't use the first option. In this case you can still use the emergency pin that you can see on the left in your dashboard. Simply press * (star) and the pin while you're waiting and the call will start. The emergency pin feature ensures that you are never locked out of your line. 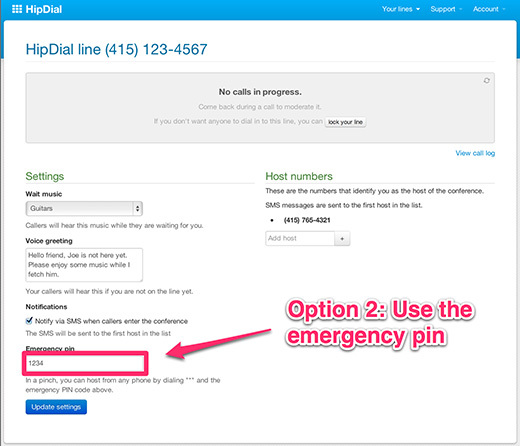 You can also share the pin with someone if you want them to start a call for you. If you're running late for a conference call and your guests are already dialed in and waiting, you can log in to your dashboard on hipdial.com from your computer or phone and manually start the call. This way everyone will be able to talk even though you're not there yet. That's it. HipDial makes it effortless to start a conference call from your own phone. At the same time, you're never locked out of your line and can use these features to use HipDial whenever you want, from whichever phone you want. The short answer of course is “Because we needed it”, but the long answer is much longer and provides an excellent subject for this first post. If you’re a busy person these days, you’ll be invited to “conference calls”. The first time this happens you’ll say, blissfully ignorant, “sure” and think nothing of it. When the day arrives, you manage to dig up the number you’re supposed to call from some old email and dial it. A computer then asks you to punch in a “Host and or Member Access Code”. Confused, you re-read the instructions. Indeed, there’s a 12-digit “security” code in there. You can’t copy and paste the PIN into the call so you try memorizing it, you don’t get it right and end up writing it on a piece of paper. You call the friendly computer again and give it the number. Now you’re asked to “Speak your name after the tone”. What the heck. You’re already five minutes late! A minute later, a click in the line and you’re in. Fortunately the call has not started yet because two of the other participants were not as fast as you. Now you are initiated. You hate conference calls and by proxy everything in and/or surrounding them. You even hate the computer voice that sounds like the demon spawn resulting from a love affair between your automated Bank service hotline and the subway train announcement voice. Little did you know that you got the lucky end of the bargain, because somebody has to host the call. Depending on the service you’re using for that you’ll need to do any number of the following fun tasks: Reserve a conference line, provide a list of all participants’ contact details, create a “room”, or even upload pictures and names for all participants! I’m not exaggerating. I wouldn’t even be if I had included two-PIN logins (one for the room and one for security), invitation emails that get flagged as spam, people getting into car accidents trying to redial into a conference they got dropped from or conference lines that required everyone to be sitting in front of a computer with an internet connection. It is all true. Suffice to say, Kevin and me were not amused and decided to make a better tool. If you want to get on the phone with one other person, you call their number and you’re done. This is well understood and couldn’t be simpler, so we decided to make a service that works in exactly the same way. We give you normal phone number and people call it to participate in the call. It’s that easy. One person is the host of the call, but even the host doesn’t need to do anything because we can identify her using via caller ID. There is no way conference calls could ever be simpler (or more compatible with existing systems and workflows). Problem solved. Take a step back and look at the conference calling services industry as a whole. It shouldn’t surprise you that the usability of existing services is so bad. The industry is dominated by large enterprise players that are very expensive and provide a sub-par experience. This sets a horrible precedent for the rest of the market, which is served by a large number of old, often local companies that are running legacy software somewhere next to a physical telephone switchboard. We already built a great product at HipDial, but our biggest advantage is our ability to quickly respond to feedback and improve the product. You can sign up for HipDial here. If you have any feedback after trying our product, please reach out. And if you have any conference call horror stories to share, we always love to hear those. Dear friends, welcome to our new blog! We'll use it to announce product updates, share tips and tricks with you, discuss industry news and probably lots of other things that we haven't thought of yet. As always, feedback is much appreciated, even for this blog. Let us know if there's anything you would like to read more about or if you think this is boring. If you like what you read and/or HipDial, please share the love with your friends, like the HipDial Facebook page and follow @HipDial on Twitter. If you just want to stay up to date with the blog you can subscribe to the feed. 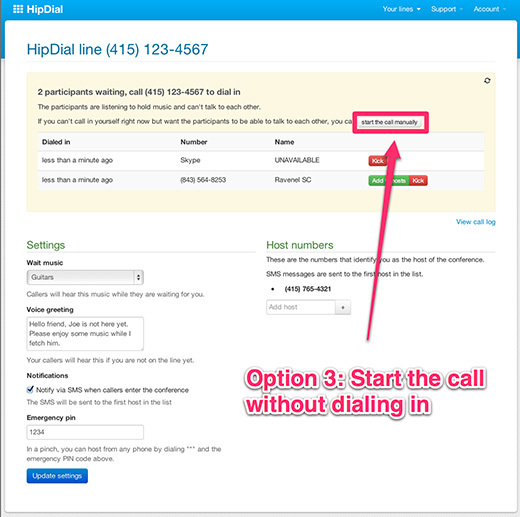 HipDial is the easiest conference calling service. There's no pin codes, no software and no reservations. Just a phone number. Dial it and you're in. Get your's now!